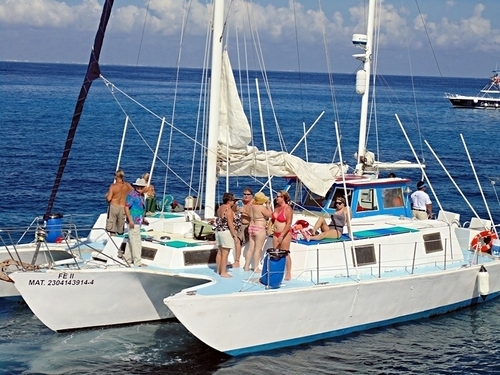 VOTED the BEST Catamaran Cruise Excursion in Cozumel since 2009! 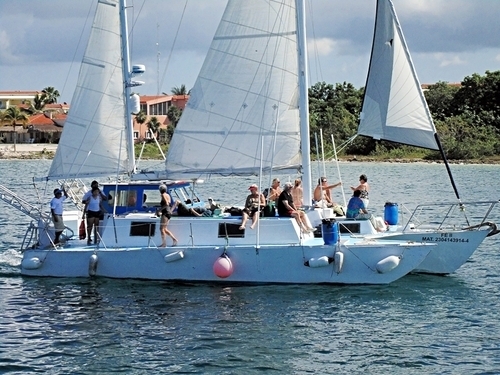 Compare to custom made aluminum and no-sailing boat "Sail and Snorkel" excursion offered by our competition (Shoretrips, Shore Excursions Group, etc). Ask them for a picture of the boat and compare! Excellent Trip Advisor Rating, 2013, 2014, 2015, 2016 and 2017 Excellence Winner & Leader up to this day! 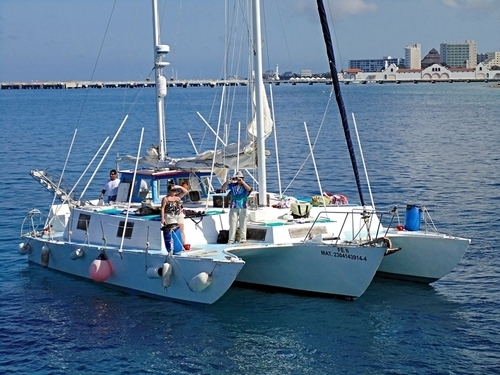 English speaking and certified snorkel guides, crew and captain, all equipment and instructions provided! Includes open bar and house-made snacks! Complimentary Wi-Fi at excursion meeting location! Best price and Worry Free Back to Ship Guarantee! 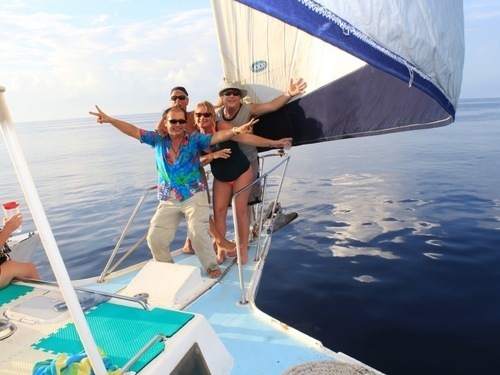 Join our experienced Cozumel sailing and snorkel excursion team for a unique Sail and Snorkel tour! 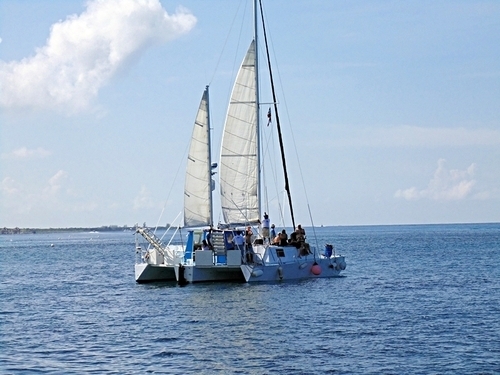 Our "Fe" Catamaran comfortably holds 28 passengers with shade and restrooms on board for a great sailing trip in Cozumel. 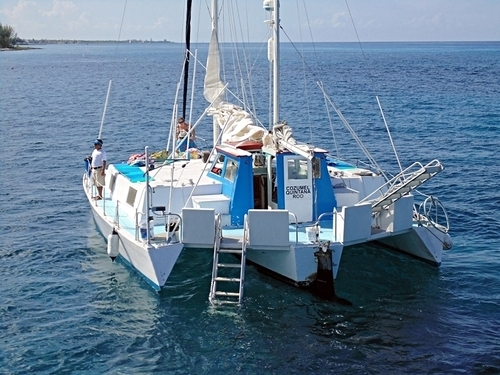 You will have 3 full hours of sailing and snorkeling (Paradise reef and either Dzul-Ha reef, Chankanaab reef or Cardona reef), lead by our local certified captain and snorkel guide, who all speak English. 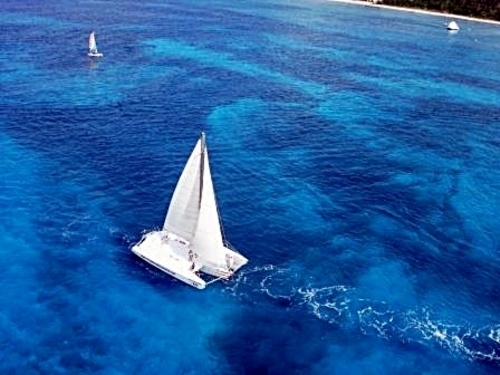 Enjoy the Mexican Caribbean 7 shades of blue water on this Sailing Tour. 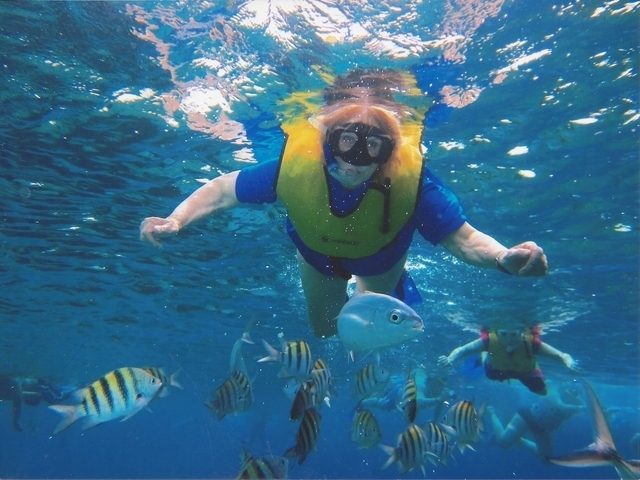 Visit coral gardens, reefs and drop offs for first class snorkeling with all equipment provided. 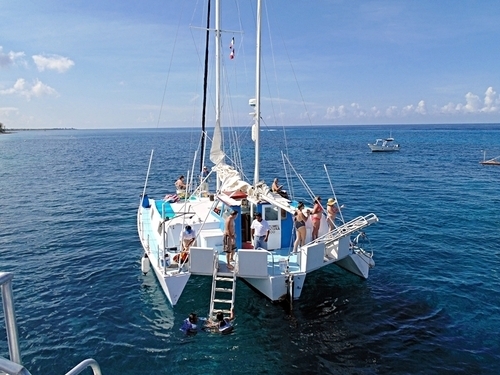 Listen to your favorite music on board our Catamaran while gliding through the crystal clear waters of Cozumel. 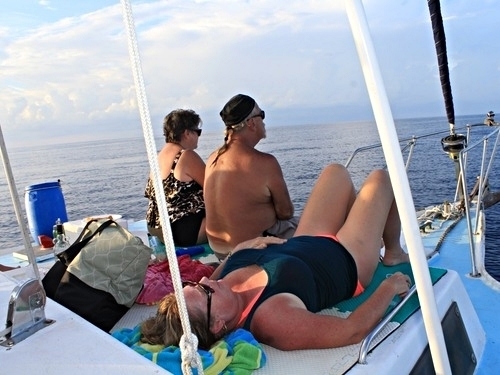 Throughout the Cozumel Catamaran Sail and Snorkel Excursion enjoy an open bar of soft drinks, bottled water, cold Corona Beer, Rum Punch, Cuba Libre (Rum and Coke), Tequila Sunrise, Tequila Shots as well as seasonal fruit and freshly prepared Guacamole with chips. 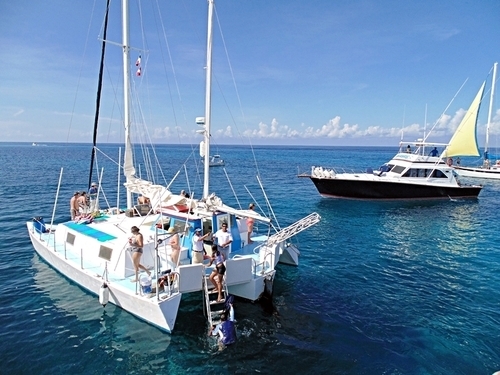 After the Catamaran Excursion, enjoy a fresh water shower and restroom facilities as well as bar and restaurant service at the beach club AND as part of booking this Cozumel Catamaran Sail and Snorkel Excursion, enjoy our beach bar where we start and return from the Cozumel catamaran sail and snorkel excursion! 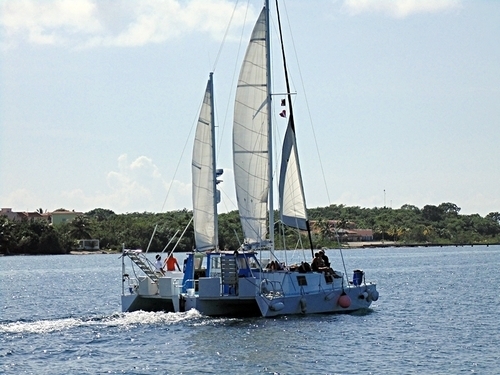 A restroom is available on board the Catamaran as well as space to store your personal belongings. 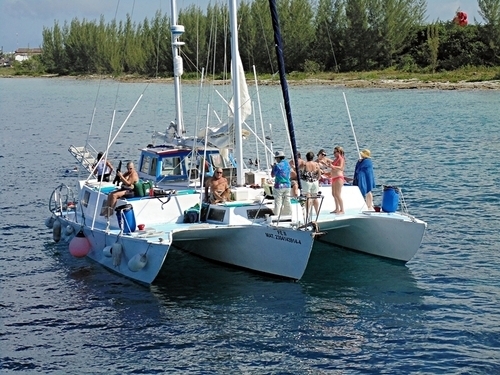 Looking for a Catamaran Sunset Cruise? 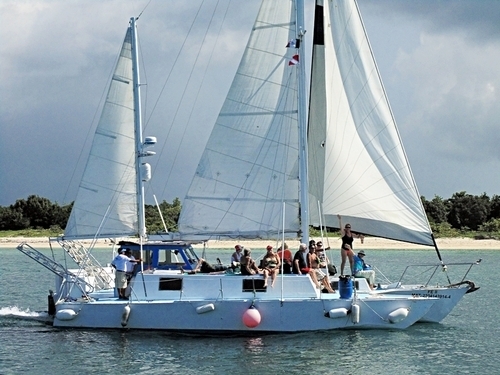 We do have it available on the same Catamaran, daily with a minimum of 4 people. 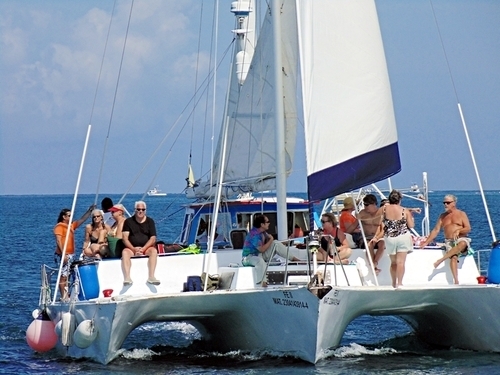 For the Catamaran Sail and Snorkel Excursion our meeting spot is just a 3 minute taxi ride away from Puerta Maya and International pier or a 5 minute taxi ride away from Punta Langosta downtown. All necessary details will be printed on your Electronic Ticket. 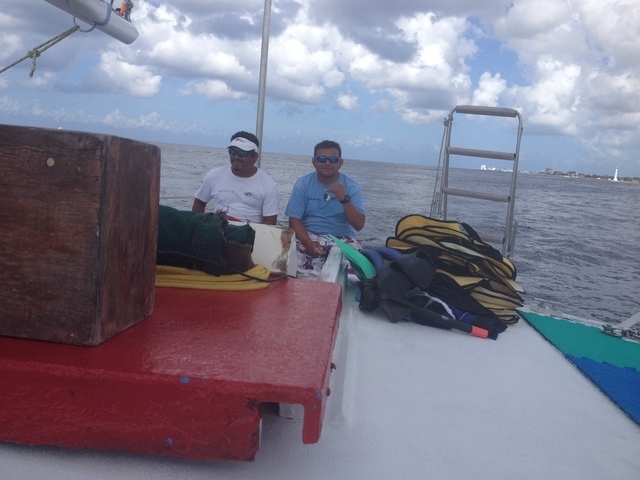 It is possible to walk from the Puerta Maya and International pier which would be an approximate 10 minute walk. We suggest you wear your swimsuit under light clothes and sandals or water shoes. Bring along your towel, a change of clothes, sun protection, cash for your balance payment, transportation, tips, etc. 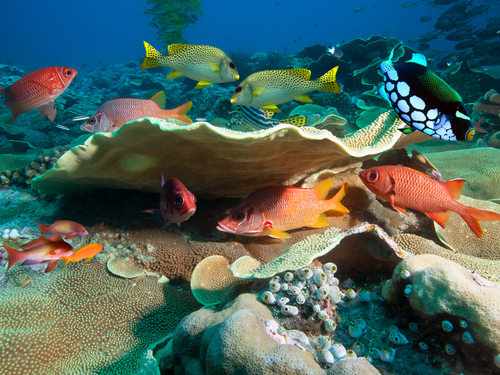 Please use biodegradable sunscreen to protect the reef and marine life. Some restrictions for water sports may apply to pregnant women and those guests with high blood pressure, asthma, diabetes and/or similar. Please consult a medical professional for more information about safe participation in this activity. People under the influence of drugs, alcohol or similar substances that may prevent safe enjoyment, are not allowed to participate in water sports actives for their own safety. This excursion is not allowed for guests with limited mobility. 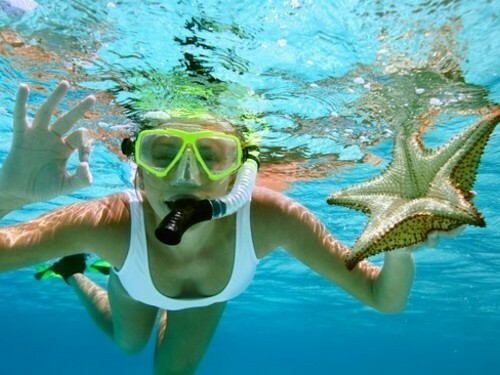 The minimum age for snorkeling is 5 years old. 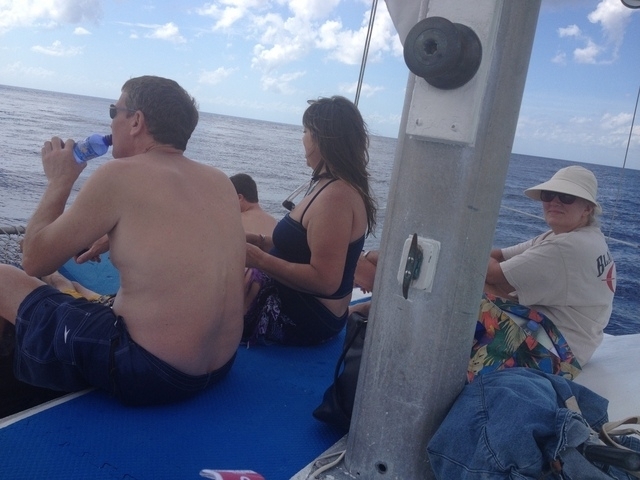 Children must be attended by a parent or guardian at all times and cannot be left unattended on the boat. The minimum age for alcohol consumption is 18 years old. A. You may can be rescheduled, just proceed to the meeting site or call us on the hotline number. A. 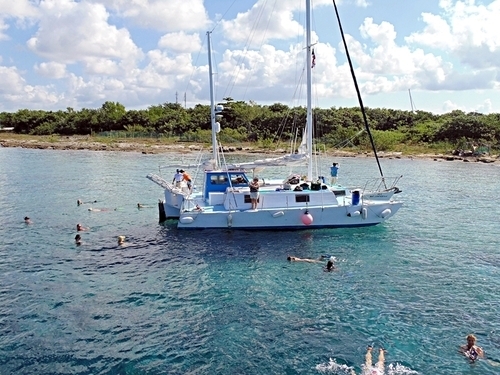 The Cozumel Catamaran Sail and Snorkel Excursion can be operated in rain or shine, however it is the local operator who will decide if the excursion may be cancelled due to safety reasons. A. Yes, there will be plenty photo opportunities during the excursion. A. Yes, absolutely. 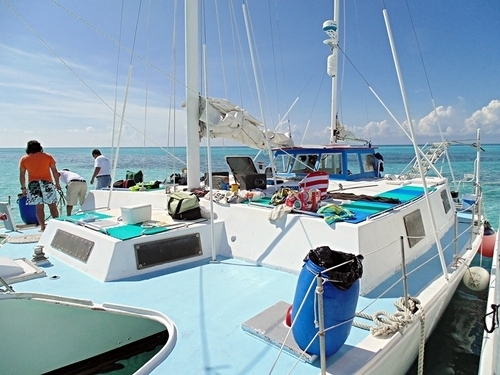 Even though we provide all equipment on the boat, you are free to bring along your own. A. 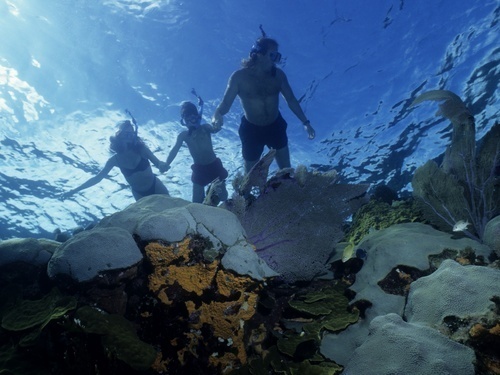 The depth of the reefs on this snorkel excursion is between 15ft to 25ft. A. No, it is not necessary to take along your passport or driver's license (unless the excursion requires a driver's license as noted in "Restrictions" and/or "Notes"). 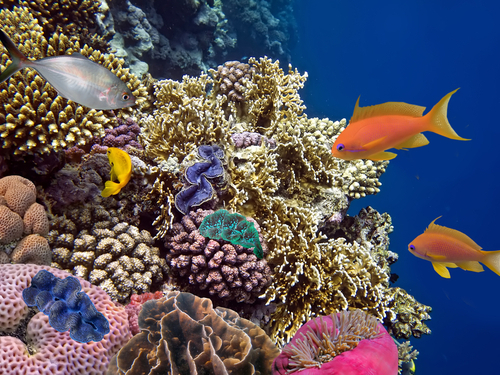 Your local Shore Excursion Operator has your booking on hand and will await you showing the Electronic Ticket or a digital copy of it on a mobile device as all tickets can be QR code scanned. Important: Reservations for the following dates are currently suspended, for more information please contact us. 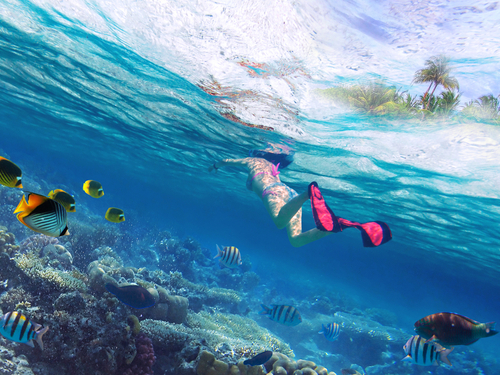 * Discount: This MED - Multi Excursion Discount is applied automatically (if applicable) to your Shore Excursion shopping cart when booking 2 or more excursions in Cozumel or in a different port of call available. Booking with us is safe. We all had a fantastic time. 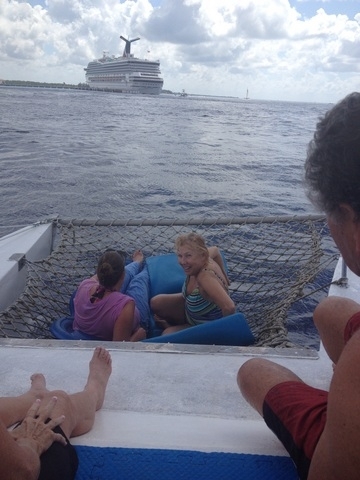 Captain and crew were very good with proper instructions to keep us all safe and help us enjoy the experience. 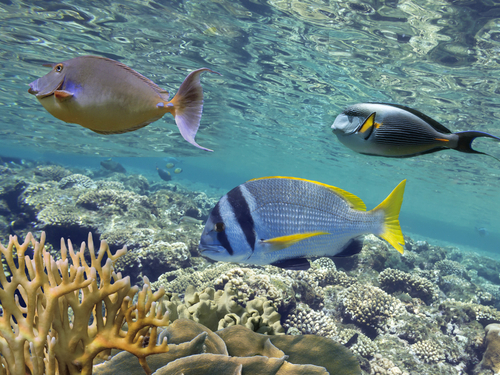 The fish were absolutely beautiful and we could have stayed all day if we didn't have to get back to our cruise ship. 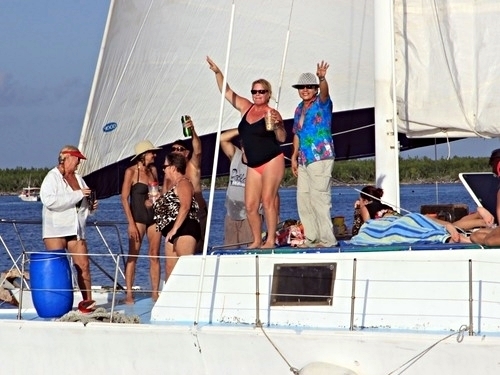 We enjoyed a beautiful sail back with drinks and snacks. We couldn't have wished for a better experience. The crew was exceptional. They took they time to explain details about the trip. The weather was perfect and we greatly enjoyed the trip. The drinks and snacks were the BEST!!! We booked this tour for our anniversary and had a great time. The crew was helpful and friendly throughout the trip and their guacamole was the best ever. Not to mention Fernando's Margaritas :). We will be back on this trip again! 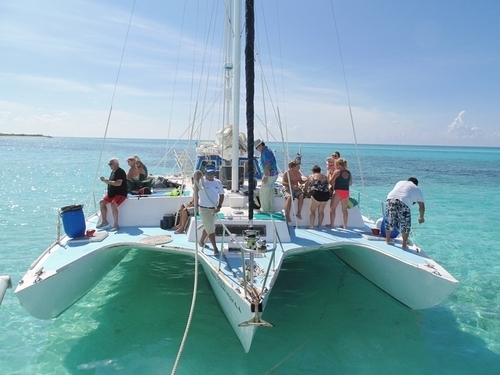 Management Response: Thank you, great to hear you had fun on the catamaran tour!